1. Sift flour and salt into a bowl. Add 2/3 cold butter cubes. Work into flour with fingers, trying to form large flakes. Add remaining butter and toss with flour mixture. Press a few times with hands, leaving larger pieces of butter. Put lemon juice into ice cold water, adding a little bit at a time to flour mixture until shaggy dough starts to form. 2. Dump out onto floured counter and form into a rough rectangle. Roll out thin, fold in thirds like book. Turn 1/4, roll out again, folding again in thirds. Repeat again. Fold and chill 30 minutes. Cut in half (1/2 for each type of pastry). Roll out each half and chill. 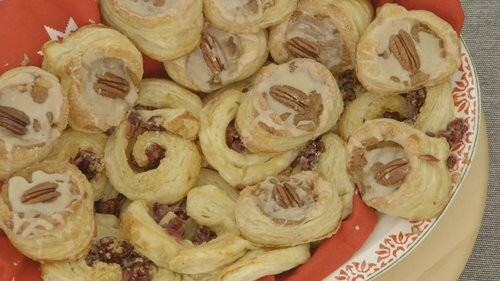 For Pumpkin Maple Spice Pastries, cut out dough with pumpkin cookie cutter. 4. For filling, beat together all ingredients (except pecans) in a small bowl until smooth. Spoon into pumpkin shaped dough cut outs. Sprinkle with chopped pecans. 5. Whisk together egg and water, brush on top of pastries. 6. Sprinkle with raw sugar. Bake for 20-22 minutes at 375F (190C). Let cool slightly. 7. Mix all icing ingredients with whisk until desired drizzling consistency, adjusting sugar and cream as needed. Drizzle over pastries. Let cool. 1. Macerate raisins in grand marnier. Microwave for 1 minute to help absorb liquid quickly. cool in fridge. 2. Combine sugar and cinnamon in small bowl, set aside. 3. Make pastry cream in saucepan over medium heat. Heat milk until very warm. In a separate bowl, whisk egg yolks, sugar, and corn starch. Slowly add heated milk, whisking continuously. Return mixture to saucepan and heat until simmering and thickened, whisking the whole time. Remove from heat, add vanilla, grand marnier, and butter. Let cool completely (chill in freezer to speed up). 4. Roll out second half of dough. Sprinkle entire dough with the cinnamon sugar mixture. 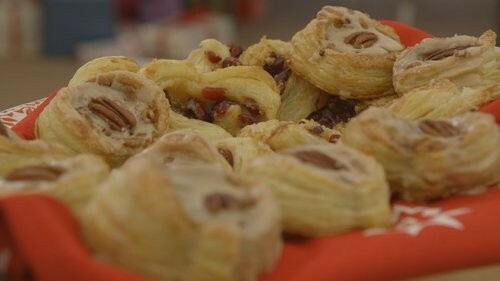 Spread with chilled pastry cream. Drain raisins and sprinkle on top of cream. Roll up into a log. Chill in freezer for 15 minutes or as long as possible. Slice into 12 and brush with egg wash. Combine raw sugar with lemon orange zest. Sprinkle sugar on top of each pastry. Bake for 25 minutes at 375F (190C). Let cool slightly. 5. Whisk together all icing ingredients until desired drizzling consistency. Drizzle over pastries. Serve.